2017 started off with Dual 30-inch Petersen Bag Stops on the City of Lowell’s 30-inch circa 1882 Cast Iron Transmission Main. As with any large water supplier in New England, there is an abundance of pre-1900 cast iron pipe and less than ideal isolation capabilities during emergency water main breaks. With this instance, Stackpole Street Booster Station has two mains available for its suction: a 24-inch and a 30-inch. An insertion valve installed on the 30-inch suction line in the 1970’s was inoperable (broken in the open position) and was leaking out of the bonnet. 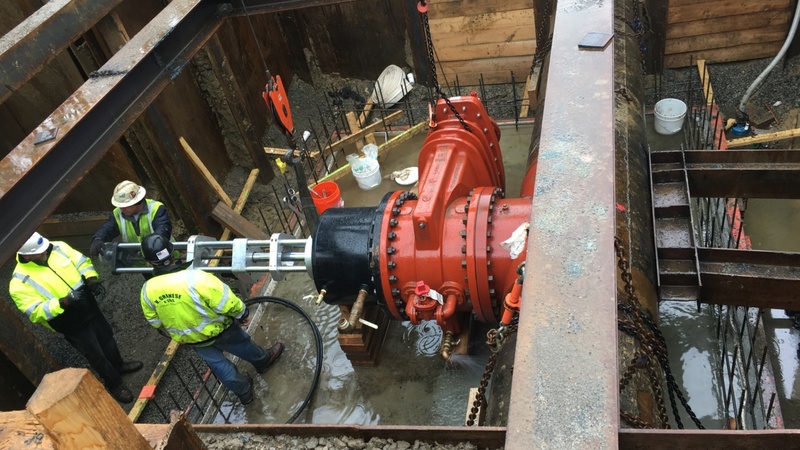 Waterline was under an existing contract for station improvements, so it was decided to add the valve replacement under their scope of work. Since there was no isolation for this station, South Shore Pipeline Services was contracted to install dual 30-inch stops on either side of the inoperable valve. We began work on March 9, deployed the stops the night of March 11, and retracted and installed the completion plugs on March 13. Backfilling was completed just in time for super storm Stella! As always it was a pleasure to work in the City of Lowell, their Water Department, and Waterline Industries.